Staro is a dark green, large-leaved chive plant with a very healthy growth. 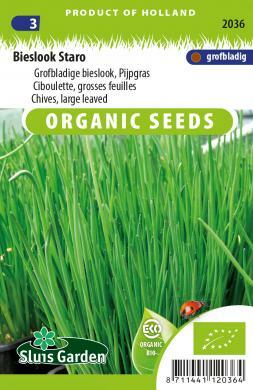 Suitable for cultivation in a greenhouse, garden or in a pot indoors. Long before the start of the Common Era man used chives. The leaves, as well as the flowers, are very popular in various dishes thanks to their onion taste. Best used fresh. Sow in the garden in rows. As soon as they can be handled, transplant to final spot. Excellent also in pots. Plant in limy, well fertilized, moist soil. Can grow in both shaded and sunny areas. Organically grown seeds * This seed has been grown, cleaned and packed according to the organic production method, which has been set by the SKAL Foundation, our number 026035 / NL-BIO-01.